Just before and during the ongoing session of the United Nations Human Rights Council, Sri Lankan authorities made several announcements to signify their commitment to pledges made in an October 2015 resolution on justice and accountability for abuses during Sri Lanka’s civil war. The Government of President Maithripala Sirisena had promised the council it would create four separate justice mechanisms and carry out security sector reforms, land returns, and reconciliation measures. While there have been a few encouraging steps, including public consultations, some land returns and more civil society freedoms, the Government has fallen far short on crucial transitional justice efforts. The three-decade long civil war ended with a decisive Government victory against the separatist Liberation Tigers of Tamil Eelam (LTTE) in May 2009. Families of victims of enforced disappearances, frustrated by numerous Government commissions that provided no answers to the fate of their loved ones, have been holding street-side vigils for well over a year. 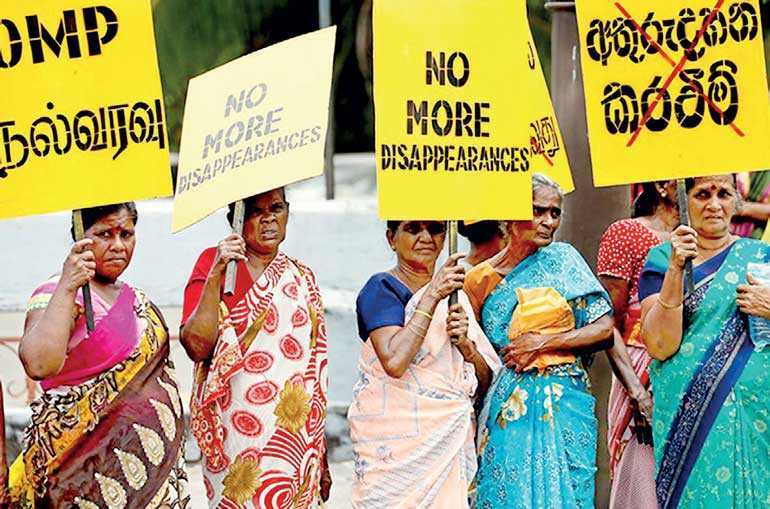 The Office of Missing Persons (OMP) was finally established earlier this year, and the commissioners, after meeting with several victims’ families around the country, have published an interim report, including in Tamil, the language of most victims. Acknowledging the massive trust deficit among victims’ families, the commission recommended some interim relief measures to alleviate the hardship until there are answers, justice and reparations. The commissioners also called on the government to ensure their independence. A draft law to set up a reparations office is also pending, but some victims’ families fear they will be expected to settle without proper accountability for conflict-related abuses. This is partly because of President Sirisena’s statements suggesting that members of the security forces – whom he has described as “war heroes” – will be protected from prosecution for any conflict-related crimes. His comments are disappointing. Among the Government’s pledges to the Human Rights Council was to create a special court with participation by international investigators, prosecutors and judges, to ensure that everyone criminally responsible on both sides will be brought to justice. Most recently, he has defended the senior most military official, who is accused of covering up the killings of 11 youths, and chided his Cabinet when they failed to support his decision. The President has reinforced this point by saying subsequently that he will introduce measures, yet unknown, at both the UN General Assembly and at the Human Rights Council. Many activists are concerned that this is an attempt to undercut the October 2015 resolution. The Government has also failed to keep its promise for security sector reform. Not only is torture in police custody still depressingly common, bur the Government has yet to repeal the Prevention of Terrorism Act (PTA), which has long facilitated indefinite detention without charge, torture, and other serious abuses. Proposals for a new counterterrorism law to replace the PTA have been seriously flawed. The latest version, approved by the Cabinet on 12 September, is harsher than the existing law, and permits the death penalty. Unless the Government starts consulting with the relevant civil society groups, this proposed law is likely to go nowhere. The fiasco over replacing the PTA is in direct contrast to the work of the OMP, which seems to be doing its best to remain independent, transparent and engaged with all partners. It lacks a mandate to refer cases for prosecution, so there are limits on its capacity to deliver justice. But it is the only promise around transitional justice that the Sri Lankan Government has met. In 2017, the Human Rights Council gave Sri Lanka a two-year extension to fulfil its pledges. Next March, the Government will have to present its report card. Despite its flurry of announcements, it’s clear much that it needs to do more. To give the Sri Lankan Government a further chance to make real progress, the council should insist upon clear, time-bound benchmarks and a monitoring framework. The victims of abuses await justice.